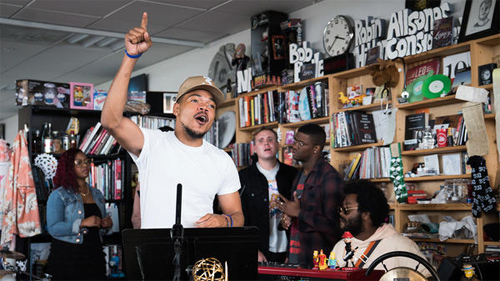 Of all the multifarious "live session" set-ups; NPR's Tiny Desk concerts are among my favourite. The artists are literally dragged into an office, propped up against a bookcase and made to perform amongst the print-outs and coffee mugs of a working radio station in Washington, DC. Chance The Rapper just did his stint at the coalface, having played to 23,000 people at an outdoor theatre in Virginia the night before. His performance was interrupted by an announcement on the building's tannoy, but he laughed it off and delivered a low-key, subtly moving performance of Juke Jam and the Stevie Wonder classic They Don't Know What I Know.